In a bowl combine dry ingredients –semolina, baking powder, soda & salt. Separate the eggs. Whip whites to a firm meringue. In a mixer bowl add sugar and zest. Rub the zest into the sugar until sugar is bright orange and fragrant. Add yolks and whisk firmly until mixture is pale and fluffy. Add milk and olive oil while whisking. Add slowly and little by little the meringue. Whisk gentler. Add dry ingredients and whisk until all ingredients are incorporated. Pour the batter into a well sprayed pan and bake for 25 minutes more or less, until golden brown. 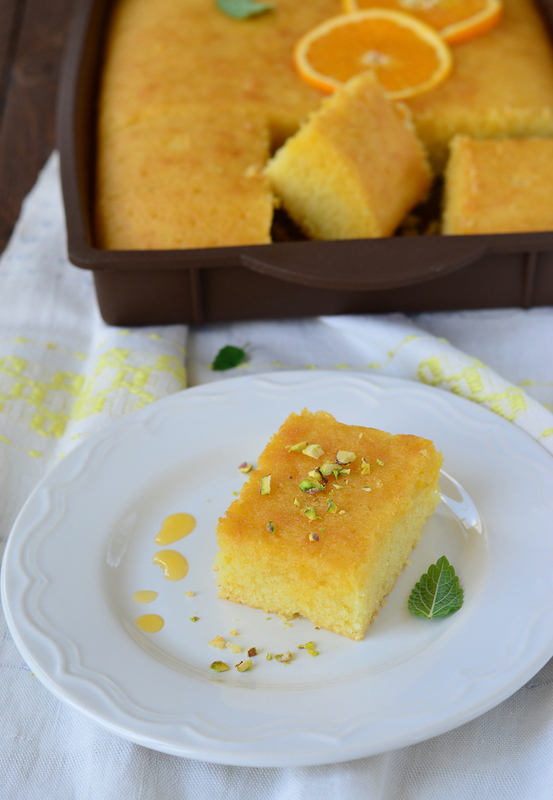 Cakes made with semolina tend to bake quicker. In the mean time make the syrup. Put all ingredients into a pot and bring to a boil. Low the heat and let cook for another ten minutes on moderate heat. Allow to cool a bit. We will need to use it warm. When the cake is ready take out of the oven and let it cool completely. The deal is: cake cool, syrup warm. Pour half the syrup over the cake and let the cake absorb, then pour the rest of the syrup. Let the cake sit for at least an hour. This cake can make a lovely dessert and it can be served with a scoop of vanilla ice cream. You can keep it in the refrigerator and serve it cool.